2017 Scott Bloomquist #18 Throwback / Dirt Late Model diecast, by ADC American Diecast Company. The Scott Bloomquist Racing #18 Throwback dirt late model was raced by Scott Bloomquist during the 2017 Dirt Late Model season. 2017 Jackie Boggs #4B Dirt Late Model diecast, by ADC American Diecast Company. The 4B Motorsports #4B dirt late model was raced by Jackie Boggs during the 2017 Dirt Late Model season. 2017 Shane Clanton #25 Super K Express / Dirt Late Model diecast, by ADC American Diecast Company. The Shane Clanton Racing #25 Super K Express dirt late model was raced by Shane Clanton during the 2017 Dirt Late Model season. 2017 Timothy Culp #c8 Carrier / Dirt Late Model diecast, by ADC American Diecast Company. The Ceight Motorsports #c8 Carrier dirt late model was raced by Timothy Culp during the 2017 Dirt Late Model season. 2018 Rick Eckert #7 Dirt Late Model 1/24 diecast, by ADC American Diecast Company. The Paul Crowl Racing #7 dirt late model was raced by Rick Eckert during the 2018 Dirt Late Model season. 2017 Rick Eckert #7 Dirt Late Model diecast, by ADC American Diecast Company. The Paul Crowl Racing #7 dirt late model was raced by Rick Eckert during the 2017 Dirt Late Model season. 2017 Tyler Erb #91 First Class Septic / Dirt Late Model diecast, by ADC American Diecast Company. The Erb Racing #91 First Class Septic dirt late model was raced by Tyler Erb during the 2017 Dirt Late Model season. 2017 Chris Ferguson #22 Dirt Late Model diecast, by ADC American Diecast Company. The Chris Ferguson Motorsports #22 dirt late model was raced by Chris Ferguson during the 2017 Dirt Late Model season. 2017 Steve Francis #15 Dirt Late Model diecast, by ADC American Diecast Company. The Steve Francis Motorsports #15 dirt late model was raced by the "Kentucky Colonel" Steve Francis during the 2017 Dirt Late Model season. 2018 Frank Heckenast Jr #99 Dirt Late Model diecast, by ADC American Diecast Company. The Heckenast Racing #99 dirt late model was raced by Frank Heckenast Jr during the 2018 Dirt Late Model season. 2018 Darrell Lanigan #14 iRacing / Dirt Late Model diecast, by ADC American Diecast Company. The Clint Bowyer Racing #14 iRacing dirt late model will be raced by Darrell Lanigan during the 2018 Dirt Late Model season. 2017 Darrell Lanigan #14 iRacing / Dirt Late Model diecast, by ADC American Diecast Company. The Clint Bowyer Racing #14 iRacing dirt late model was raced by Darrell Lanigan during the 2017 Dirt Late Model season. 2018 Chris Madden #44 Firecracker 100 Winner / Dirt Late Model 1/24 diecast, by ADC American Diecast Company. The CMR Chris Madden Racing #44 dirt late model was raced to victory by Chris "Smokey" Madden in the 12 Annual World of Outlaws Firecracker 100 at Learnersville Speedway. This car features the Firecracker 100 2018 Winner logo on the decklid. 2017 Chris Madden #44 Dirt Late Model diecast, by ADC American Diecast Company. 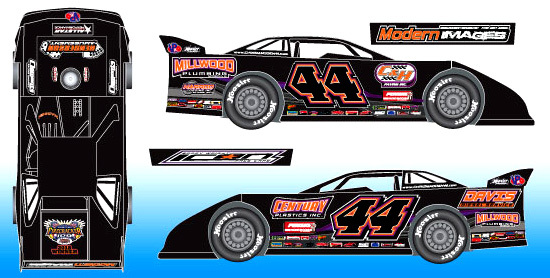 The CMR Chris Madden Racing #44 dirt late model was raced by Chris "Smokey" Madden during the 2017 Dirt Late Model season. 2018 Mike Marlar #157 RS Equipment / World of Outlaws 2018 Champ / Dirt Late Model 1/24 diecast, by ADC American Diecast Company. This Mike Marlar Racing #157 dirt late model features the 2018 World of Outlaws Craftsman Late Models Champion logo on the decklid. Mike Marlar, the 2018 World of Outlaws Craftsman Late Models Champion! 2017 Mike Marlar #157 RS Equipment / Knoxville Nationals Champ / Dirt Late Model diecast, by ADC American Diecast Company. Mike Marlar raced this #157 Delk Equipment dirt late model to victory in the 14th Annual Lucas Oil Late Model Knoxville Nationals. This diecast car features the Knoxville Nationals 2016-2017 Champion logo on the decklid. 2017 Jimmy Mars #28 Deppe Enterprises / Dirt Late Model diecast, by ADC American Diecast Company. The Mars Racing #28 Deppe Enterprises dirt late model was raced by Jimmy Mars during the 2017 Dirt Late Model season. This diecast car features the World of Outlaws Lernerville Speedway Working Man 50 2016 Champion logo on the decklid. 2017 Tim McCreadie #39 Sweeteners Plus / Dirt Late Model diecast, by ADC American Diecast Company. The Coffey-McCreadie Enterprises #39 Sweeteners Plus dirt late model was raced by Tim McCreadie "T-Mac" during the 2017 Dirt Late Model season. 2017 Devin Moran #9 Dirt Late Model diecast, by ADC American Diecast Company. The Team DMR/TTR Donnie Moran Racing and Tye Twarog Racing #9 dirt Late model was raced by Devin Moran during the 2017 Dirt Late Model season. 2016 Billy Moyer Jr #21 Dyna-Gro / Dirt Late Model diecast, by ADC American Diecast Company. The Billy Moyer Racing #21 Dyna-Gro dirt late model was raced by Billy Moyer Jr during the 2016 Dirt Late Model season. 2018 Earl Pearson Jr #1 Lucas Oil / 2018 Dirt Million Winner / Dirt Late Model 1/24 diecast, by ADC American Diecast Company. The Dunn-Benson Motorsports #1 Lucas Oil dirt late model was raced to victory by Earl Pearson Jr "The Hurricane" in the Dirt Million at Mansfield Motor Speedway. This car features the Dirt Million 2018 Winner logo on the roof. 2017 Earl Pearson Jr #1 Lucas Oil / Dirt Late Model diecast, by ADC American Diecast Company. The Dunn-Benson Motorsports #1 Lucas Oil dirt late model was raced by Earl Pearson Jr "The Hurricane" during the 2017 Lucas Oil Late Model Dirt Series season.